The rain kept coming in the Bronx, never severe but never quite letting up. The first-place Rays had been playing from behind since Raul Ibanez’s home run in the fourth, and in section 212 of Yankee Stadium, two rows into the coveted dry area out in right field, I wondered if this would be the night. Mariano Rivera, the greatest closer in baseball history, tore his ACL on Thursday while shagging batting practice flies in Kansas City. After 608 career saves, a staggering 0.70 postseason ERA, and anything else you’d ever want in the witches’ brew of a Hall of Famer, the 42-year-old’s career was in jeopardy. He pulled a MacArthur and vowed to return, but now there are complications. And even if he does return, his words — mostly of the I can’t go out like this variety — carry a prideful aura. He wants to prove a point, and he wants to have his farewell tour. Which is great and completely deserved, but it probably means the Rivera Era is done. At some point, the David Robertson Era — however it will be viewed by history (who coached at UCLA after John Wooden again?) — had to begin. Joe Girardi was cagey about whether he’d use Robertson or Rafael Soriano as closer, but the patterns that emerged since the injury all pointed to Robertson. Still, it had to be tested in a real save situation. None of this Kansas City test-flight stuff. A glance at the crowd revealed about 40 percent capacity from section to section. It was a great game on paper, with Ivan Nova facing James Shields as the Yanks tried to climb to the top of the division, but the rain kept some people away from the get-go (they couldn’t even be lured by the giveaway — a free hand-sanitizer key chain), and it drove others to the comforts of the concourse and beyond as the game went along. Nova was fantastic through five, but Tampa started to chip away at the lead, scoring one each in the sixth, seventh, and eighth. Ibanez hit his second home run in the seventh, and A-Rod scored an insurance run on a Mark Teixeira double an inning later. Going into the top of the ninth, the numbers aligned: 5-3 Yankees, and Robertson was the man warming up in the left-field pen. Here’s how it worked when Mariano came out for the ninth inning of a save situation. First, the PA announcer — the late, legendary Bob Sheppard, and Paul Olden after him — would intone his name with the requisite gravity, and the crowd would go wild even before the first notes of Metallica’s “Enter Sandman” began to play. With the music sending everyone into a fever pitch, the gap between innings was one of the best parts of the whole ballgame. Mariano, stoic and calm, sailed to the mound like the human personification of that impossible concept — reassurance. And then he threw the famous cutter over and over, and everyone rose to their feet when the strike count read two, and the Yankees won. Here’s how it worked Tuesday. As Robertson left the bullpen, the first notes of “Sweet Home Alabama” twanged out over the PA. Makes sense, since he’s from Birmingham. But then the 5,959-square-foot video screen came to life, and Derek Jeter, Robinson Cano, and Curtis Granderson pleaded with Yankees fans to send in their ballots for the upcoming All-Star Game. By the time they finished, Robertson was already at the mound. (A purposeful deflection from the producers, or just the ho-hum life after Mariano?) Jeter, A-Rod, and Cano stood in a pack by second base watching, and the video screen showed three semi-miserable guys in red ponchos and an old woman with a beret who stuck her tongue out. My girlfriend poked me with a pen to the rhythm of the song as I tried to convince both of us that this moment mattered. 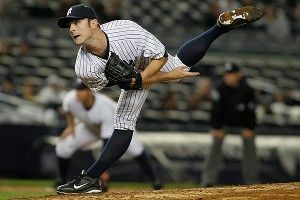 “Now pitching for the Yankees,” Olden said, “number 30, David Robertson. Number 30.” There was a smattering of applause, but nothing that would indicate Yankee Stadium was aware of the great transition. By the way, David Robertson is really good. Coming into the game, he’d allowed just 10 base runners in 12 innings, and his ERA was a perfect 0.00. He had registered 21 strikeouts to just three walks. Behind me, a fan explained Robertson to his friend. That last part is not even remotely true. He was drafted by the Yanks in 2006 and has been with the big club since 2008 (one of my best live memories was watching him get out of an extra-innings, no-out, bases-loaded jam against the Twins during the 2009 playoff run), and he keeps getting better. Last year, he made his first All-Star Game and finished with a 1.08 ERA in 66 innings. He’s 27, tops out near 95 mph, and throws a lot of fastballs, some curveballs, and a very occasional changeup. He wears his dark socks high on the leg, like A-Rod and Granderson. The first pitch of the David Robertson Era was a 93-mph fastball to Jeff Keppinger. The second was another fastball, and Keppinger turned this one into a groundout to second. That’s when things got a little interesting. He started Will Rhymes with three straight balls, and ended up walking him to put the tying run at the plate. Then Sean Rodriguez waited out a few fastballs before hitting a ground ball that could have been a game-ending double play, but instead went in the hole between short and third for a single. Jeter and Martin walked to the mound to share a calming word or two. It worked — Brandon Allen stepped in for the light-hitting Jose Molina, but Robertson was all over him. After a strike looking and a foul, the soggy crowd mustered an impressive energy to cheer on the legend’s replacement. Robertson reared back and fired the strikeout pitch, sending Allen to the dugout. With two away, a spirited “Let’s go Yankees” chant was started up somewhere to my right, but they lost their vigor when Robertson walked Ben Zobrist on five pitches. “This isn’t Mariano,” affirmed the fan behind me. “He always does this,” moaned another. Let’s be charitable and put it this way: If the “Yankees fans are spoiled” stereotype is true, it didn’t help the entitled group psychology to have Mariano Rivera in pinstripes for the better part of two decades. With the bases loaded, Girardi came out for a visit. Jeter and Martin joined him, hoping that more soothing words would do the trick. There should be microphones everywhere, I thought, but only I should hear them since we might otherwise get into some messy civil liberties territory. A couple walked down the aisle in my section to take a picture at the rail with the field as a backdrop. On the mound, the skipper and the captain left the new closer alone. Carlos Pena stepped in, and Robertson delivered a devastating curve. The fans rose to their feet — were they sensing victory, or hoping to urge it along? Pena took strike two, then laid off the kind of high heat Mariano used to throw, back in the ’90s. One more ball, and then Robertson delivered the death blow — a fastball on the outside corner. Dwarfed and made insignificant by the roar, Pena put his arm around umpire Jim Joyce to voice his final complaints. The Yankees all came to Robertson, and the video screen showed WCBS’s John Sterling shaking with joy as he delivered his famous line, and the PA played Sinatra’s famous song. History having been made, we followed the soaked masses to the 4 train. well, it happened. He’s not Mariano, but he’s got his own thing going. Welcome to the era.